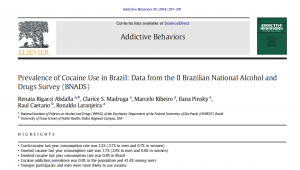 OBJECTIVE: To determine the current prevalence rates of cocaine use and dependence in a representative sample of the Brazilian population, and to investigate possible associations with sociodemographic factors. pulation including an oversample of 1157 adolescents (14 to 18 years old). The survey gathered information on alcohol, tobacco and illegal substances use as well as on risk factors for abuse and dependence. The Severity of Dependence Scale was used to evaluate cocaine dependence rates among users. RESULTS: Last year consumption of crack-cocaine was 2.2% in the overall population excluding the elderly group. Lifetime and last year prevalence rate of snorted cocaine was 3.9% and 1.7%, respectively. Smoked cocaine use in Brazil was estimated in 1.5% for lifetime and 0.8% for last year use. Cocaine addiction was identified in 41.4% between users in the prior year. CONCLUSIONS: The prevalence rates of snorted and smoked cocaine in Brazil suggests that the country is amongst the nations with greatest annual consumption rates becoming one of the biggest consumer markets of cocaine worldwide. Prevention and treatment policies should take this into consideration and strengthen the focus on cocaine use in the country. alcohol y los trastornos por consumo de alcohol también lo son. 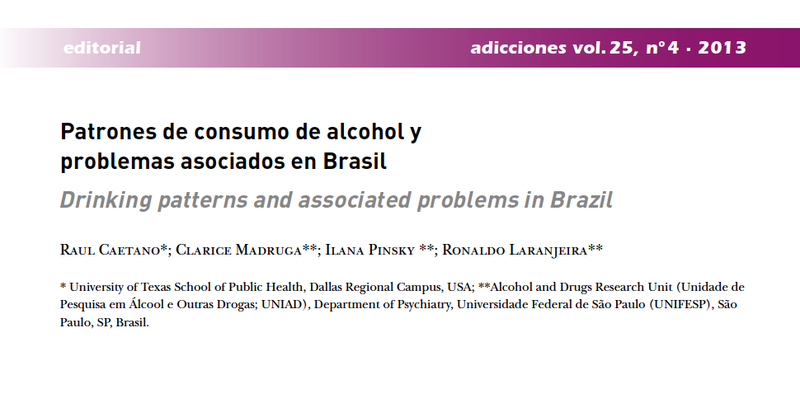 Alcohol use patterns among Brazilian adults. Laranjeira R, Pinsky I, Sanches M, Zaleski M, Caetano R.
2010 Sep;32(3):231-41. Epub 2009 Nov 13. OBJECTIVE:To describe patterns of alcohol consumption in the adult Brazilian population. METHOD:Multicluster random sample of 2,346 subjects 18 years of age or older, selected nationwide. Interviews were conducted in respondents’ homes between November 2005 and April 2006. RESULTS:About 48% of the sample had not drunk alcoholic beverages in the past year, with variations by gender, age, marital status, education, income and region of the country. Among drinkers, 29% reported drinking 5 or more drinks per occasion (men, 38%). Sociodemographic variables are associated with the frequency and amount of drinking, alcohol problems, and alcohol abuse and dependence. Among the whole sample (including drinkers and non drinkers), 28% reported binge drinking, 25% reported at least one kind of alcohol related problem, 3% were alcohol abusers and another 9% were alcohol dependent. DISCUSSION:Abstinence is high in the Brazilian population. However, elevated proportions of those who drink consume alcohol in a high risk pattern (binge-drinking), report a high level of alcohol problems, alcohol abuse and dependence. National public policies must consider these factors, as well as the regional Brazilian differences. Madruga CS, Laranjeira R, Caetano R, Pinsky I, Zaleski M, Ferri CP. 2012 Oct;37(10):1171-5. doi: 10.1016/j.addbeh.2012.05.008. Epub 2012 May 24. OBJECTIVE: We estimate the prevalence of alcohol, tobacco and illegal substance use in a national representative sample of adolescents. We also estimate how socio demographic characteristics, household environment and mental health are associated with substance misuse. METHOD: This is a cross-sectional study using data from the first Brazilian National Alcohol Survey, which gathered information on the use of psychoactive substances in 761 participants aged 14 to 19 years old. Weighted logistic regression was used to calculate adjusted odds ratios. RESULTS: More than half of the adolescents interviewed were regular alcohol users and one out of ten were abusers and/or dependents. Older male adolescents living in urban areas were more likely to present alcohol related disorders and to smoke. Age had an inverse association with illegal substance use. Smokers and those using illegal substances were more likely to report domestic violence while those with alcohol abuse/dependence were more likely to have depression. CONCLUSIONS: The high prevalence of alcohol, tobacco and illicit substance consumption among Brazilian adolescents is staggering. Young males with mood disorders from urban areas are more at risk of developing alcohol disorders while illegal drug use is highly associated to household dysfunction in early life. Brazilian growing economy will possibly lead to increased levels of substance use among adolescents if new prevention measures are not implemented. The intensification of law enforcement strategies to reduce psychotropic substances access is required. Alcohol consumption in late-life–the first Brazilian National Alcohol Survey (BNAS). Castro-Costa E, Ferri CP, Lima-Costa MF, Zaleski M, Pinsky I, Caetano R, Laranjeira R.
2008 Dec;33(12):1598-601. doi: 10.1016/j.addbeh.2008.07.004. Epub 2008 Jul 22. To investigate the alcohol consumption in later life in Brazil and its association with socio-demographic characteristics. This study was a cross-sectional analysis of nationally representative survey data. A multistage cluster sampling procedure was used to select 3007 individuals of 14 years of age and older from the Brazilian household population. In this study we analyzed data from all 400 participants who were over 60 years old. Alcohol Abuse and Dependence Syndrome was established according to DSM-IV and Risky Drinking was defined in two ways: heavy drinkers (>7 drinks/week) and as binge drinkers (>3 drinks/one occasion). Twelve percent of participants reported heavy drinking behavior while 10.4% and 2.9% were binge drinkers and alcohol dependent respectively. In the adjusted logistic regression only gender was associated with heavy drinking behavior. Males, the youngest and the wealthiest were more likely to report binge drinking behaviors. In conclusion, alcohol related-problems are common but under recognized among older adults. Health professionals should be aware that common definitions of alcohol abuse and dependence may not apply as readily to older people, who have had biological changes for alcohol tolerance and its effects on the Central Nervous System. Madruga CS, Laranjeira R, Caetano R, Ribeiro W, Zaleski M, Pinsky I, Ferri CP. 2011 Mar;36(3):251-5. doi: 10.1016/j.addbeh.2010.10.011. Epub 2010 Oct 28. BACKGROUND: Substance misuse has been a major source of health and social problems in developing societies as it has been elsewhere. There is a growing body of evidence from developed nations linking early exposure to violence in childhood with substance misuse in adulthood. The role of depression on this association is not clear. 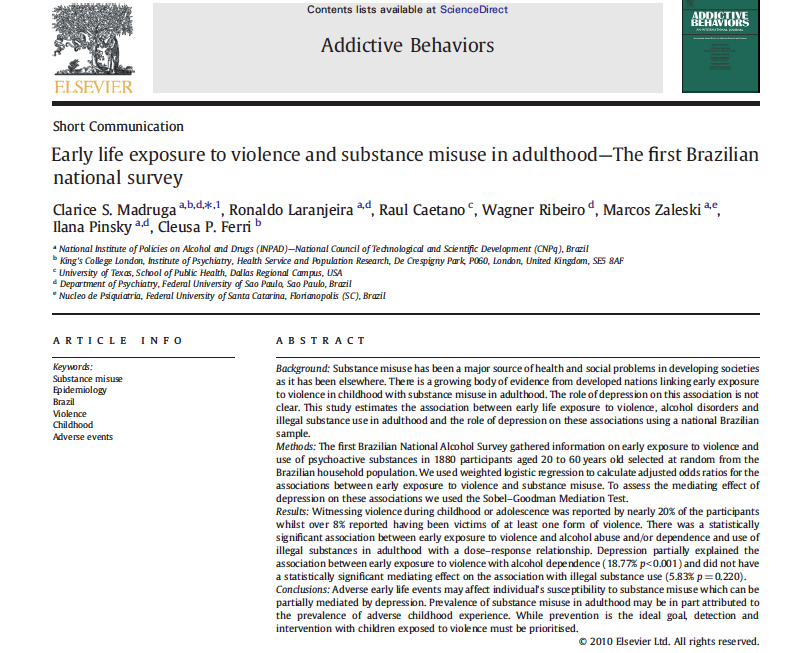 This study estimates the association between early life exposure to violence, alcohol disorders and illegal substance use in adulthood and the role of depression on these associations using a national Brazilian sample. METHODS: The first Brazilian National Alcohol Survey gathered information on early exposure to violence and use of psychoactive substances in 1880 participants aged 20 to 60 years old selected at random from the Brazilian household population. We used weighted logistic regression to calculate adjusted odds ratios for the associations between early exposure to violence and substance misuse. To assess the mediating effect of depression on these associations we used the Sobel-Goodman Mediation Test. RESULTS: Witnessing violence during childhood or adolescence was reported by nearly 20% of the participants whilst over 8% reported having been victims of at least one form of violence. There was a statistically significant association between early exposure to violence and alcohol abuse and/or dependence and use of illegal substances in adulthood with a dose-response relationship. Depression partially explained the association between early exposure to violence with alcohol dependence (18.77% p<0.001) and did not have a statistically significant mediating effect on the association with illegal substance use (5.83% p=0.220). CONCLUSIONS: Adverse early life events may affect individual’s susceptibility to substance misuse which can be partially mediated by depression. Prevalence of substance misuse in adulthood may be in part attributed to the prevalence of adverse childhood experience. While prevention is the ideal goal, detection and intervention with children exposed to violence must be prioritised. Caetano R, Mills B, Pinsky I, Zaleski M, Laranjeira R.
2012 Jan;107(1):60-8. doi: 10.1111/j.1360-0443.2011.03567.x. Epub 2011 Oct 7. University of Texas School of Public Health, Dallas Regional Campus, Dallas, TX, USA. AIMS: To examine the proportion of self-reported alcohol consumed by different gender and age groups in Brazil over the past year, and to examine whether the ‘prevention paradox’ applies to Brazilian data on alcohol-related problems. DESIGN: A multi-stage cluster sample, representative of the Brazilian household population. SETTING: This study was conducted in Brazil between November 2005 and April 2006. PARTICIPANTS: Respondents were aged ≥ 14 years (n = 3007). MEASUREMENTS: Measures included past year estimates of (i) number of standard drinks, (ii) frequency of binge drinking, and (iii) alcohol-related problems. FINDINGS: The survey response rate was 66.4%. The top 2.5% of the drinkers by volume consume 14.9%, the top 5% consume 27.4% and the top 10% consume 44.2% of all alcohol consumed in Brazil. Men consume 77.8% of the total alcohol, and 18-29-year-olds consume 40.3%. Individuals below risky drinking guidelines for weekly volumetric intake account for 49-50% of all problem drinkers and 45-47% of all problem types reported. Individuals who do not binge or who binge infrequently (1-3 times/year) account for 50-51% of all problem drinkers and 45-46% of all reported problem types. Most binge drinkers are low-volume drinkers. CONCLUSIONS: Consistent with the prevention paradox literature, most drinking problems in Brazil are associated with low or moderate drinking. Binge drinking accounts more clearly for the distribution of alcohol problems than total volume consumed. Jungerman FS, Menezes PR, Pinsky I, Zaleski M, Caetano R, Laranjeira R.
2010 Mar;35(3):190-3. doi: 10.1016/j.addbeh.2009.09.022. Epub 2009 Sep 26. 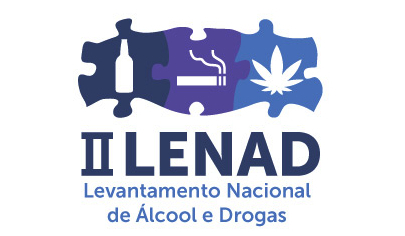 AIMS: To estimate the prevalence of cannabis use in the last 12 months in the Brazilian population and to examine its association with individual and geographic characteristics. DESIGN: Cross-sectional survey with a national probabilistic sample. PARTICIPANTS: 3006 individuals aged 14 to 65 years. MEASUREMENTS: Questionnaire based on well established instruments, adapted to the Brazilian population. FINDINGS: The 12-month prevalence of cannabis use was 2.1% (95%CI 1.3-2.9). Male gender, better educational level, unemployment and living in the regions South and Southeast were independently associated with higher 12-month prevalence of cannabis use. CONCLUSION: While the prevalence of cannabis use in Brazil is lower than in many countries, the profile of those who are more likely to have used it is similar. Educational and prevention policies should be focused on specific population groups. Pinsky I, Sanches M, Zaleski M, Laranjeira R, Caetano R.
2010 Sep;32(3):242-9. Epub 2010 Apr 30. 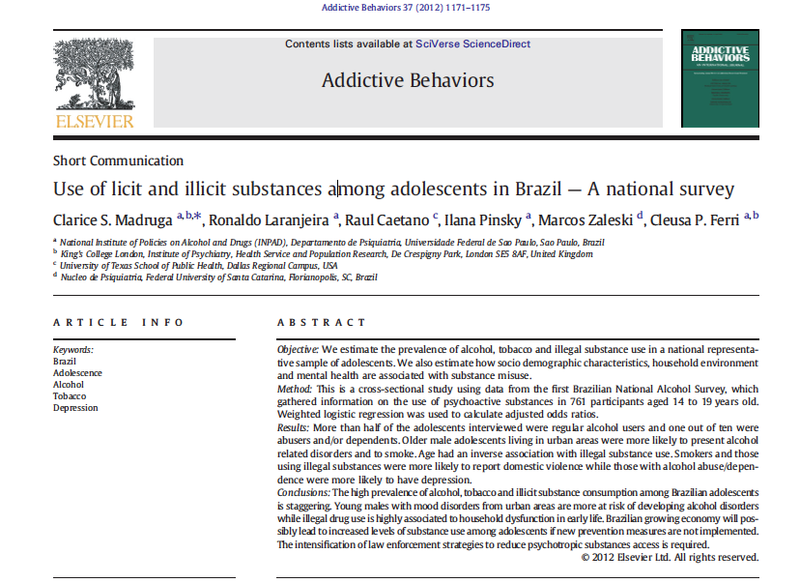 OBJECTIVE: To describe patterns of alcohol consumption by adolescents in Brazil. METHOD: From November 2005 to April 2006, a sample composed of 661 subjects aged between 14 to 17 years was rigorously selected in Brazil using a multistage probabilistic method to represent the profile of the adolescent Brazilian population. RESULTS: 34% of Brazilian adolescents drink alcoholic beverages. The mean age of drinking initiation was 14 years of age. Older adolescents, as well as those living in the southern part of Brazil, those who are not attending school and those who are working, and black individuals and those with personal income reported a higher frequency of drinking. Socio-demographic factors such as gender, income bracket, family income and student status do increase the amount of alcohol consumed. Males report a higher frequency of binge drinking than females. Moreover, more than half of the males that had drunk in the previous year reported having engaged in binge drinking on at least one occasion. Beer represents approximately half of all the drinks consumed by adolescents. There was no significant difference between genders in the kind of alcohol consumed. DISCUSSION: Among adolescents who drink, the consumption of several drinks is frequent. Alcohol consumption varies from region to region, social economic status (including self-generated income) and age. 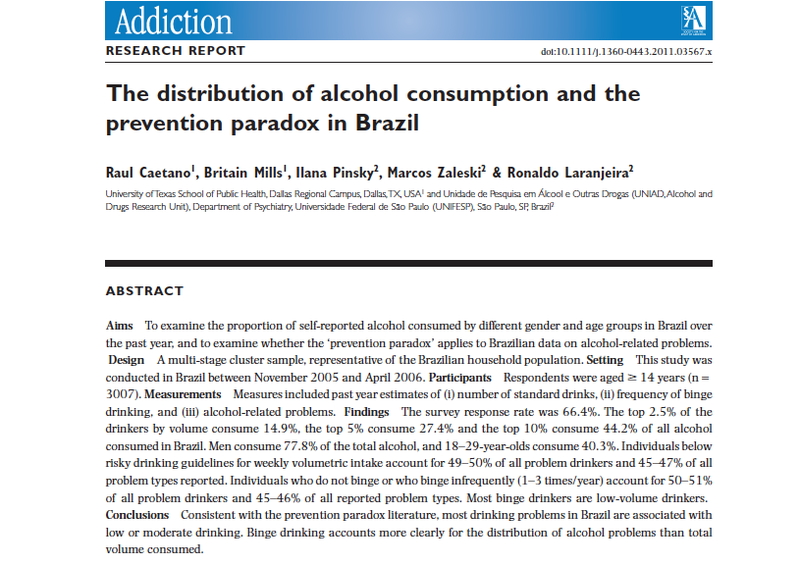 These findings are discussed in light of their importance for the development of alcohol prevention policies in Brazil. Madruga CS, Ferri CP, Pinsky I, Blay SL, Caetano R, Laranjeira R.
OBJECTIVE: This study describes the prevalence and pattern of tobacco use among the elderly in Brazil and establishes its association with socio-demographic characteristics, other substance use and depression. 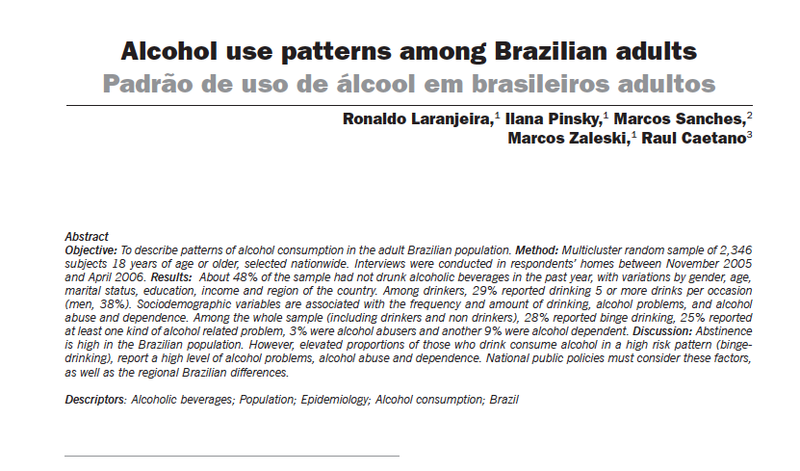 METHOD: The analyses were performed in 400 individuals aged 60 years and over who participated in the first Brazilian national alcohol survey (BNAS) in 2000. RESULTS: Nearly 60% of the sample had ever smoked, of them one in three were still smoking at the time of the interview. Most (94.3%) of the tobacco users were smoking everyday and 34.3% consuming more than 20 cigarettes a day. Only 1% of the former smokers had received support to quit. Over half of the current users (65%) would use free treatment to quit if it existed in Brazil, and just under half of them (47.4%) would consider quitting if cigarettes’ price were higher. Currently, tobacco users were more likely to be men and alcohol abusers. Prevalence of depression was high regardless participant smoking status (33.0% among non-smokers, 34.7% among current smokers and 39.3% among former smokers). There was no significant association between smoking and depression. CONCLUSION: This study found a disturbingly high proportion of tobacco users among the elderly in Brazil. According to the Global Burden of Disease project, tobacco has the highest mortality risk of all substance use categories, especially for the elderly. This study shows there is an urgent need to develop smoking cessation interventions targeted specifically to the elderly. Zaleski M, Pinsky I, Laranjeira R, Ramisetty-Mikler S, Caetano R.
2010 Apr;25(4):648-65. doi: 10.1177/0886260509334396. Epub 2009 Jun 2. Purpose: To estimate prevalence rates of intimate partner violence (IPV) among Brazilian couples and to assess the contribution of drinking and sociodemographic factors to the risk of IPV. Methods: A sample consisting of 1,445 married or cohabitating males and females in the Brazilian population was interviewed. The survey response rate was 66%. Results: The analyses indicate 10.7% and 14.6% prevalence, respectively for male-to-female and female-to-male IPV. Males were drinking in 38.1% of IPV events and females in 9.2%. The male’s partner was drinking in 30.8% and the females’ partner in 44.6% of IPV acts. Bivariate associations between violence and sociodemographics were found for age groups, household monthly income and educational level. Logistic regression analysis indicate that younger age for both male and female partners, men with no religious affiiliation and women who are homemakers are significant predictors of violence. Conclusion: This survey provides important information to further IPV research in Brazil. Polanczyk G, Laranjeira R, Zaleski M, Pinsky I, Caetano R, Rohde LA. Int J Methods Psychiatr Res. Department of Psychiatry, University of São Paulo Medical School, Brazil. BACKGROUND: Attention deficit hyperactivity disorder (ADHD) is a clinically significant disorder in adulthood, but current diagnostic criteria and instruments do not seem to adequately capture the complexity of the disorder in this developmental phase. Accordingly, there are limited data on the proportion of adults affected by the disorder, specially in developing countries. METHOD: We assessed a representative household sample of the Brazilian population for ADHD with the Adult ADHD Self-report Scale (ASRS) Screener, and evaluated the instrument according to the Rasch model of item response theory. RESULTS: The sample was comprised by 3007 individuals, and the overal prevalence of positive screeners for ADHD was 5.8% [95% confidence interval (CI), 4.8-7.0]. Rasch analyses revealed the misfitt of the overall sample to expectations of the model. The evaluation of the sample stratified by age revealed that data for adolescents showed a signficant fittnes to the model expectations, while items completed by adults were not adequated. CONCLUSIONS: The lack of fitness to the model for adult respondents challenges the possibility of a linear transformation of the ordinal data into interval measures and the utilization of parametric analyses of data. This result suggests that diagnostic criteria and instruments for adult ADHD must take into account a developmental perspective. Moreover, it calls for further evaluation of currently employed research methods in light of modern theories of psychometrics. Zanoti-Jeronymo DV, Zaleski M, Pinsky I, Caetano R, Figlie NB, Laranjeira R.
The aim of this study was to investigate the prevalence of physical abuse and exposure to parental violence during childhood, in relation to socio-demographic characteristics. Multi-stage sampling was used to select 3,007 individuals 14 years or older in 2005-2006, from all regions of the country. The study detected cases of physical abuse (beating, striking with objects, burning or scalding, threatening and/or using knives or firearms) and exposure to parental violence (witnessing parental threats and/or actual physical aggression) during childhood. Analyses were performed with the Pearson chi-square test. Prevalence of history of physical abuse in childhood was 44.1% (33.8% moderate, 10.3% severe). Prevalence of exposure to parental violence was 26.1% (7.5% witnessed moderate parental violence and 18.6% severe). Combined analyses of these two types of violence showed significant associations between them. The findings may help implement intervention strategies to call the attention of health professionals to the high prevalence of this type of violence.